I’ve tried to write this article so many times. In fact I’m up way later than I need to be in another attempt to write this very important article. I can be candid with you though. I’m afraid. I’m afraid of the second layer of stigma that will come with this admittance. I’ve fought and eased my way through the first layer until we got to here - where it no longer bothers me to tell someone my depression story. I can - without many skips of beats - talk about my suicide attempt and how far I’ve come and how willing I am to help someone else see the light of recovery. But this next layer is so tricky. This next layer involves so much shame and blame and uncertainty mixed with certainty, doubt - and experience that proves otherwise. I’m talking about the layer where I admit that I take Wellbutrin and my dosage just increased. Is that incredibly courageous or incredibly weak? Is that something to file away in the mental vault of a scarlet-letter type secret or something to wear as a badge of strength instead? I want to tell you that I always find myself on the side of courage and strength. But I’d be lying if I told you that. Just recently in fact, I had an experience with a dearly beloved who thinks my choice to take medication is a crutch and that I am willfully taking the easy way out. This dear one is convinced that the hard things are the ones you should be doing. Work harder Leah he says. Work harder. Get off the meds and work harder. And for a good long minute, I wondered if he was right. Am I just lazy about my self improvement? Am I just not working hard enough? Am I really taking the easy way out, medicating myself? Have I given up on myself in some crucial way? I felt the shame. I felt the judgement (even though he assured me that he wasn’t judging me). 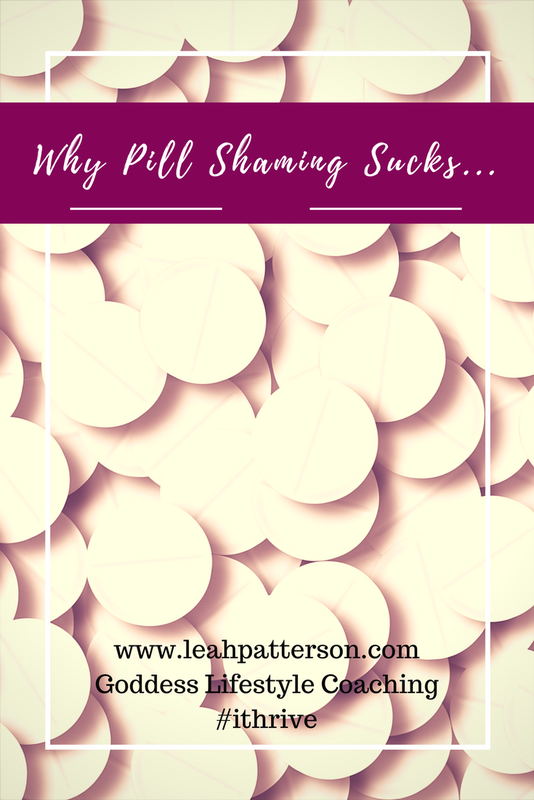 I felt his refusal to understand why my medication could ever be something good for me, even if just for right now. I felt it all. But then I remembered who I am. This is going to go there, so stay with me through the woo woo. I remembered that I AM is just enough. I AM is. The rest is just details. They are the details of this life that I get to experience. They are the details that I get to choose and evaluate for myself and then make more choices. I don’t ever have to *get it right* or do it the way that works for anyone else simply because I am not anyone else. And that means that there is no standard that I have to ascribe to. That shame I was feeling, that’s based on duality. The duality that he is right and I am wrong. But that is a *this* level view and now, because of all the work I’ve done on self, I have a *higher* level view. That view shows that he is right and *I* am right. I am always right for me. And the more that I connect with and get to know, accept and love myself, the closer this rightness gets to linking me up with my bliss expressed. But I’m always on the right path. And I don’t have to go faster than I’m comfortable going and I don’t have to take the steps that someone else would take. They wouldn’t stick for me anyway, *until I’m ready for them*. So. I may be ready to take the next step of choosing no medication one day soon or one day later. I know for instance that when I’m blessed with pregnancy (keep the good vibes going my friends! ), that it’s something I’ve already decided I want to explore. The baseline point though is that I must take every step forward *when I’m ready*. And only me and the Universe really know when that is. And that’s what I want to leave you with. The beautiful and sometimes frustrating thing about life is that, you can get advice, input and suggestions, but the final decisions always lie with you. You do have a beautiful guide though in your own intuition. You just have to get quiet enough and practice enough to hear it <3.